Contrary to much of the conventional understanding of how people learn about their communities, Americans turn to a wide range of platforms to get local news and information, and where they turn varies considerably depending on the subject matter and their age, according to a survey by the Pew Research Center’s Project for Excellence in Journalism and Internet & American Life Project, produced in association with the John S. and James L. Knight Foundation that asks about local information in a new way. Most Americans, including more tech-savvy adults under age 40, also use a blend of both new and traditional sources to get their information. Overall, the picture revealed by the data is that of a richer and more nuanced ecosystem of community news and information than researchers have previously identified. The survey echoes longstanding research that more Americans report watching local TV news than any other source—which has led to widely held idea that people go there for most of their community news and information. But it also finds that Americans tend to rely on the medium for just a few topics—mainly weather, breaking news, and to a lesser degree, traffic. These are the most widely followed local subjects. Yet consumers rely on other sources for most other local topics. Younger adults, moreover, rely on local television less, a fact that suggests more vulnerability for the medium in the future. The survey also yields some striking findings for newspapers. Most Americans (69%) say that if their local newspaper no longer existed, it would not have a major impact on their ability to keep up with information and news about their community. Yet the data show that newspapers play a much bigger role in people’s lives than many may realize. 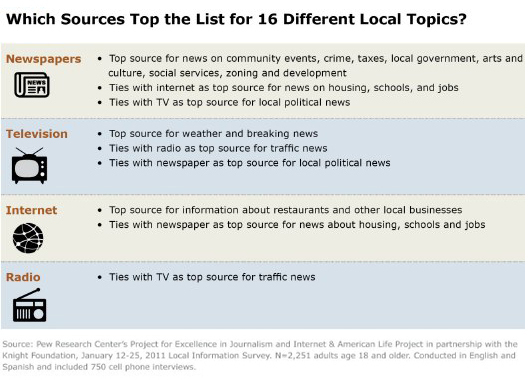 Newspapers (both the print and online versions, though primarily print) rank first or tie for first as the source people rely on most for 11 of the 16 different kinds of local information asked about—more topics than any other media source.1 But most of these topics—many of which relate to civic affairs such as government—taxes, etc., are ones followed by fewer Americans on a regular basis. In other words, local TV draws a mass audience largely around a few popular subjects; local newspapers attract a smaller cohort of citizens but for a wider range of civically oriented subjects. The survey also sheds light on the emerging role of the internet as people seek local news and information. The internet is defined here as web-only online destinations. For adults generally, the internet is a main source for information about restaurants and other local businesses, and it is tied with newspapers as a top source for material about housing, jobs and schools—all areas that place a special value on consumer input. Yet when one looks at the 79% of Americans who are online, the internet is the first or second most relied-upon source for 15 of the 16 local topics examined. For adults under 40, the web is first for 11 of the top 16 topics—and a close second on four others. At the same time, the survey finds both citizen-based information sources and some very old forms of media remain vital as well. Print newsletters, online listservs and old-fashioned word of mouth are important means by which people learn in particular about community events and local schools. In all, the data in a new national survey show that the majority (64%) of American adults use at least three different types of media every week to get news and information about their local community—and 15% rely on at least six different kinds of media weekly. And nearly half of all American adults, 45%, say they do not even have a favorite local news source. Instead, in the modern local news information system, different media outlets, and in many cases entire platforms, are gaining footholds for specific topic areas. While this can help news sources establish an identity with audiences, it also raises a critical question: If a platform were to wither or disappear, would parts of the community go unmonitored? The new survey was administered from January 12-25 among a nationally-representative sample of 2,251 adults age 18 and older on landline and cell phones. It has an overall margin of error of plus or minus 2 percentage points. Conventional research has tended to ask people about local news and information generically with some variation of a simple question: Where do people turn most often for their news? Asked that way, the majority of people answer local TV, which has made it the most popular news source in America. That is reinforced by ratings data that shows that the combined ratings of local television news programs exceeds that of other local media. The biennial media consumption survey of the Pew Research Center for the People and the Press similarly finds that local TV news is the medium most people turn to for news and information of any type. And this new survey, too, finds that local TV is the most frequently used medium for news and information, with 74% watching local newscasts or visiting local TV websites at least weekly, compared with 50% who turn to newspapers and their websites, 51% to radio (on air and online), and 47% who turn to web-only sources. But this survey also took a new approach as well, asking people about the information sources they rely on to get material about 16 different specific local information areas. The result is a more complex portrait of how people learn and exchange information about community. The new data explodes the notion, for instance, that people have a primary or single source for most of their local news and information. Rather, Americans appear to discern significant differences in the strengths of different information sources. They recognize that there may be more information about their child’s school on a parent-run listserv than on television or even their neighborhood weekly paper. They recognize that if they want information about zoning or local government, it may be more available in the newspaper they do not regularly buy than on the television station they watch many days for traffic and weather. The most popular local topics are weather (89% of people get it), breaking news (80%); local politics (67%) and crime (66%). The least popular on our list of topics are zoning and development information (30%), local social services (35%), job openings (39%) and local government activities (42%). Nearly half of adults (47%) use mobile devices to get local news and information. Not surprisingly, mobile is particularly popular for “out and about” categories of information, such as restaurants. And 41% of all adults can be considered “local news participators” because they contribute their own information via social media and other sources, add to online conversations, and directly contribute articles about the community. Both these groups are substantially more likely than others to use the internet to get local news and information on almost all topics. Social media is becoming a factor in how people learn about their local community, but it is not as popular as other digital forms. In all, 17% of adults say they get local information on social networking sites like Facebook at least monthly. Mobile phone applications, or “apps,” have yet to emerge for most local topic areas. Even now, though, 5% of Americans say they rely on a mobile app for weather information. Old-fashioned word of mouth is still a factor in sharing local news and information, especially at the neighborhood level for information about local businesses, restaurants and schools. 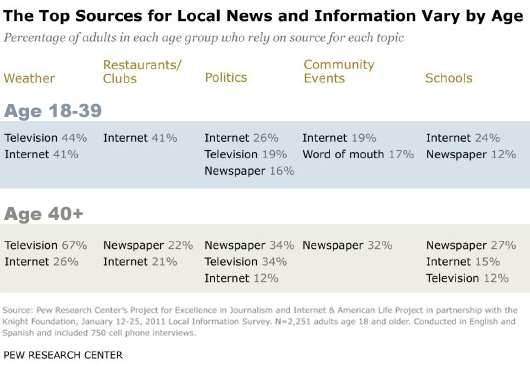 In all 55% of all adults get local news and information via word of mouth at least once a week. Word of mouth is particularly likely to be cited by younger residents as one of their top platforms for community events. Adults age 40 and older are more likely to prefer word of mouth as a source for local politics, local government activity, housing and real estate, zoning, and social services. The websites of newspapers and TV stations do not score highly as a relied-upon information source on any topics. They have gained modest footholds as sources that users rely upon for a variety of topics, including weather information, crime, politics, and breaking news, but overall they consistently score in the low single digits when it comes to being the source that people rely upon on any of the topics we queried. While there are a variety of demographic dimensions that are linked to the way people get local news and information, the most striking is the difference between younger and older information consumers. Simply put, one generation into the web, older consumers still rely more heavily on traditional platforms while younger consumers rely more on the internet. Among adults under age 40, the web ranks first or ties for first for 12 of the 16 local topics asked about. This move by younger users to rely on the internet for local information puts considerable pressure on traditional news organizations. Even though most have moved aggressively online with ambitious websites and social media strategies, there is evidence in the data that people find specialty websites and search engines a preferable way find the local material they want.